Leadership is not always about the glorious crowning act. It is about leading the team to keep the focus on your goal and motivate them to achieve that goal. A leader leads his team with great effort and working with them. As a leader, you need to hold yourself responsible for getting higher standards that anybody expects from you. What Do You Do to Keep Focus On Your Goal? A powerful leadership can help to turn out failure into success. With the ability to attract people through strong communication, leaders can generate trust among people. This can be done only if you believe in yourself first. This trust will help them in fulfilling their motive. Leadership makes it easy to do the right things. If you want to be a good leader, you need to think about big goals. Thinking of big goals will lead you to higher success. On the other hand, thinking of little goals will lead to small achievements. If people believe in themselves, they can get everything they want. People are not born as a leader; it is their inner quality to turn other’s mind with their powerful thoughts. Being a leader, first, you need to believe in yourself. Do what you want and what you believe in. Paint your dreams in a frame to get them. People will follow the way that you show them. You need to think big to achieve big goals in life. Many great leaders in history have lived by virtue in life. They influence and motivate people to get involved to fulfill a particular task. In British-ruled India, Mahatma Gandhi was the pre-eminent leader of Indian independence movement. He was born as an ordinary boy with a determination to do what he did. His protest through civil disobedience and policy of non-violence succeeded when he led the country to get freedom. Along with characteristics of knowledge and people-skills, Mahatma Gandhi had the motivational approach and leading skills. You are absolutely capable of doing anything and letting people follow you. If you have leadership quality and belief in yourself, then you can motivate people to help you achieve any particular task. Get everything you want by keep focus on your goal. 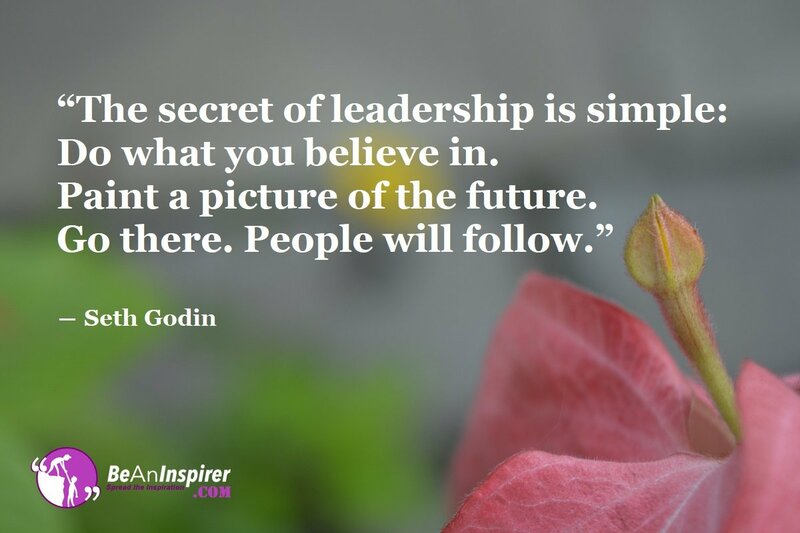 Leave us a comment below in the comment box and share your leadership ideas to inspire people. How Can Courage Conquer Your Fears? What Is Leadership To You? How To Use Mind And Heart With Different Situations?